Is there a new player at the top-end Thunderbolt interfacing table? Stunning audio quality with ultra high-resolution recording rates and gorgeous preamps designed with Neve’s involvement. 32-bit integer audio conversion and sample rates up to 384kHz. Well-designed software control panel makes for intuitive setup. Front panel configuration is a touch fiddly. Few anticipated that one of the talking points of this year’s NAMM show would centre around a head-turning piece of hardware from Steinberg. 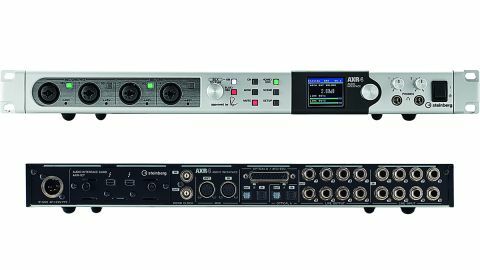 And yet, here is the flagship AXR4 Thunderbolt 2 audio interface, promising a feature set to make rival top-end interface designers sit up and take note. A panel tour hints usefully at what lies beneath... There are four mic/line preamps at the front, designed in partnership with Rupert Neve, whose involvement warrants his signature being embossed front and centre. In particular, Neve’s ‘Silk’ technology is available for use whilst recording, with your choice of ‘Red’ or ‘Blue’ algorithms per preamp. These musically ‘distort’ the input signal with differing harmonic footprints, to bring some trademark Neve class to the recording stage. Having chosen your Silk colour, the rotary dial lets you decide how much to add and the results represent a classy front end to your recordings. Further to the right are two independent headphone ports, whilst the back panel provides an additional 8 1/4” input and output ports, digital options via ADAT, S/PDIF and AES/ EBU connectors, MIDI interfacing and two Thunderbolt 2 ports for connection to your computer and to provide daisy-chaining; up to three AXR4s can be linked within a single system. Operation can be configured directly from the front panel, via a combination of button presses and the rotary wheel (which doubles as a button to confirm data entry). Life is easier if you choose to organise the AXR4 via software, though, within which a more traditional mixer arrangement provides intuitive assignment of levels, monitor effects, routing options and more via a dedicated control panel. It’s important to note that, currently only Mac drivers are available for the AXR4 but the Windows driver should arrive shortly. Audio interfaces are ultimately judged on their sound quality and the AXR4 boasts some eye-catching numbers; up to 384kHz recording rates via 32-bit integer resolution. Steinberg’s interface offers some parallels to the way rivals go about their business too. Like Universal Audio’s Apollo range, effects hosting (a bundled effects suite is provided by Yamaha) is processed on the AXR4’s internal chips, removing the load from your computer’s CPU. The range of effects doesn’t come close to matching the UAD ecosystem just yet but it’ll be interesting to see if Steinberg intend to expand its titles in future. Equally, just as Apogee’s preferential status within Logic Pro X means its preamps can be configured per channel within Logic’s mixer, so Cubase users will love the ‘immediate’ relationship they can enjoy with the AXR4, with per- channel channel strips directly controllable within Steinberg’s DAW. In summary, quality oozes from every pore here. There’s a new contender in town in the pro audio interfacing arena.